Burnley Ladies took all three points from an under-strength City of Manchester ladies team as they continue to press for a top-three finish. Previous encounters against City of Manchester have always been tough for the Lady Clarets, due to their free-scoring star player Rachel Dunlop. 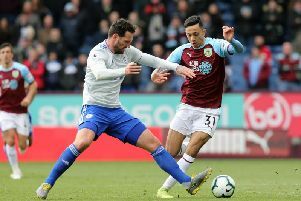 This time, however, it was evident that City of Manchester were missing other key players and the Lady Clarets would have the competitive advantage. Player of the match Lizzy Hamer pushed hard at the Manchester defence, twisting and turning to find a way through and deliver her trademark crosses, but early shots did not trouble the keeper or were blocked by the hard-working defence. After several minutes, Rebecca Hayton had the ball in the net, but she was judged off-side. City of Manchester were able to push forward and pick out Dunlop, who tested the Clarets back line. But Clarets youngster Kim Sykes closely marked her and manahed to keep her quiet. A forward ball picked out Holly Hunter, who shot from wide, forcing the keeper to palm away the ball from up high. City of Manchester were unable to clear the ball completely, and after other Claret shots failed to find the target. Hayton struck, and again forced a save that was picked up by Linny Craig, who drove her shot home for the opening goal. Soon after, the Clarets strengthened their hold on the game when a second goal resulted from a Hayton corner. City of Manchester were still breaking out, but struggled to penetrate the final third in a game that was becoming very one-sided. The Clarets were to score twice more before the break. A cross from Craig lofted over the keeper and was headed home by Justine Wallace, and then Hayton scored from a Hamer through ball. Just before the break, City of Manchester came close from a free kick that had to be tipped over the bar by Taylor Gregson. In the second period, the Clarets played with the advantage of a strong wind, and two early goals by Hayton and Evie Priestley preceded a City of Manchester resurgence. Gregson was called into action and cleared a dangerous ball in the nick of time, and soon had to intercept a cross to maintain her clean sheet. As the half progressed, City of Manchester tired and the Clarets scored almost at will. Georgia Payton got a brace and Hayton completed her hat-trick. The resounding win lifts the Lady Clarets’ goal difference and keeps them in contention for a top three finish, though they will face a much tougher test this Sunday when they travel to unbeaten league leaders Bolton Wanderers Ladies.